Advertisements from books and magazines from the late Victorian and Edwardian era. 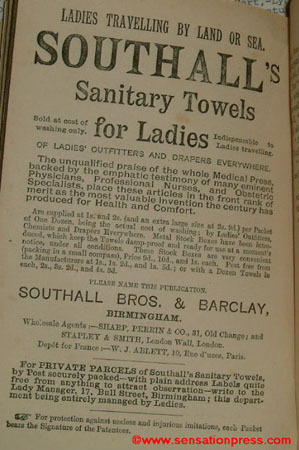 Unlike the other advertising pages, I have gone beyond the Victorian age to include later adverts for sanitary products. An advert published in a yellowback novel by Chatto & Windus in 1885. An advert published in a paperback novel published by the Hansom Cab Company c. 1888. The Sanitary Wood Wool Company. 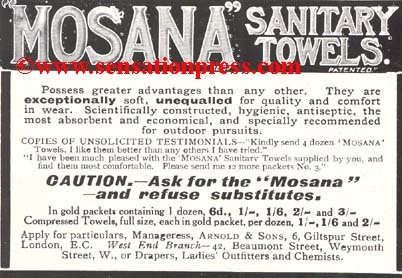 An advert from a yellowback book published by Routledge in 1892. 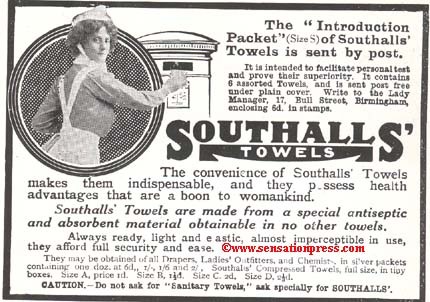 An advert for Southall Towels from a weekly magazine in 1894. On this occasion, a free gift was offered to those taking part in a bazaar - providing she provided the company with a list of stall holders. 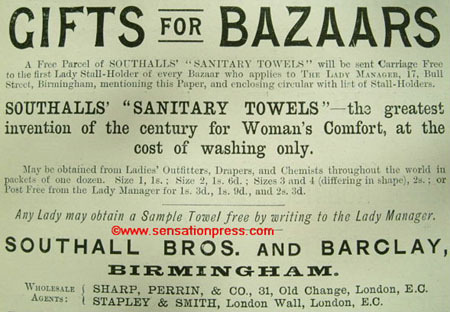 Wholesale Agents: Sharp, Perrin, & Co.
As well as the usual range, 'Special make for use after accouchement' (ie after giving birth). 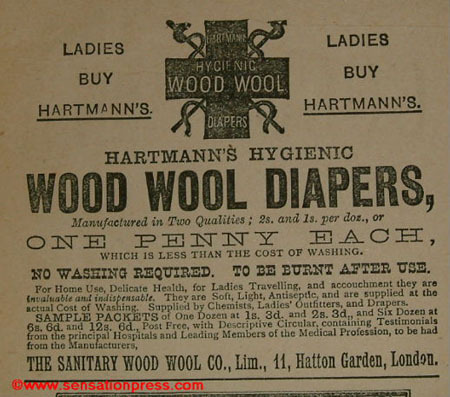 The Sanitary Wood Cool Company Ltd.
An advert from a paperback novel published by the Amalgamated Press c. 1902. An advert from a Newnes sixpenny paperback novel c. 1905. An advert printed at the back of a paperback novel published by Ward, Lock & Co. in 1910. 'Possess greater advantages than any other. They are exceptionally soft, unequalled for quality and comfort in wear. outdoor pursuits.' Manufactured by Arnold & Sons. A magazine advert published in 1913. Discreet postal delivery in a 'plain cover', with the suggestion that a nurse would deal with the orders!